The Router Bit itself can be consider an accessories because of all the option that it brings. The basic router can be used in a myriad of manners, follow various patterns, and countless cuts. 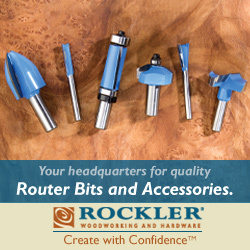 When purchasing router bits, you have the option of selecting either piloted or no pilot bits. Piloted Router Bits are used when cutting a decorative profile on the edge of a straight or curved workpiece where the entire edge of the stock is not to be removed. No Pilot Router Bits offer no edge guides and have flutes that will cut all the way to their tips. Router bits are available in three types of materials, and should be selected on the basis of the amount of use they're expected to receive and the types of materials they're intended to cut. High-Speed Steel Bits are the least costly and are intended for occasional use. Carbide-Tipped Bits have become the most commonly available of all bits. Solid Carbide Bits are the most costly of all available bits. Virtually nowhere are you more at the mercy of a vendor than with router bits. So much is hidden and so little is visible that you have to rely upon the reputation and guarantee of the vendor. It is no longer even possible to use country of origin as a reliable indicator of quality. Router Bits are available in a wide variety of profiles for performing many different specialized jobs. The 10 bits shown here are designed for grooving and for making cutouts in panels. These bits typically have no pilots. Router Bits are available in a wide variety of profiles for performing many different specialized jobs.The 9 bits shown here are designed for cutting decorative edging (or joinery profiles) and for trimming workpiece edges. These bits are typically piloted. Choosing between up and down cut router bits is one of many things in woodworking that can be frustrating until the reasoning behind the design difference is understood a little better. The number of email questions on this subject instigated this story. While a few are certain that I am doctoring the photos and/or video, the more Earth-based folks know there is a more logical cause for their issues. In many cases we find that a miss-alignment of the guide collar and bit are at the heart of the problem.